In terms of regular-season power production, Rancho Cucamonga stood high above the rest in the California League. Its 202 roundtrippers were 55 better than any other team and consistent home run output throughout the playoffs carried the Quakes to a third championship. A quartet of Dodgers prospects, including eighth-ranked Jeren Kendall and No. 24 Cristian Santana, went deep asa Rancho Cucamonga completed a three-game sweep of Visalia with a 9-1 victory at LoanMart Field. The title is the first since 2015 for the Quakes, who have made five appearances in the Championship Series since 1994. "It's such a special moment and this year has been, by far, just a banner year in my life," said Rancho Cucamonga skipper Drew Saylor, who last month became the winningest manager in franchise history. "It speaks volumes to our whole organization. ... To be able to bring a championship here just means the world to me and my family." Donovan Casey matched a career high with four RBIs and fell a double shy of the cycle in his fourth professional four-hit game and first this season. Casey, 22, played 62 games in his first full season with Rancho Cucamonga, missing nearly three months with a broken bone in his left hand. The 2017 22nd-rounder out of Boston College batted .253/.316/.378 with six homers, eight doubles and 30 RBIs in limited action. He went 10-for-29 (.455) with eight RBIs in seven playoff games. "He really understood just kind of what we do here, what our advance scouting reports are, how we dive into the data and the analytics, and he was able to understand it a little bit more consistently," Saylor said. "When he came back, he was able to buy into that vision." Nick Yarnall scored three runs, doubled and homered in the third inning to make it back-to-back jacks with Santana. Kendall had a difficult postseason, hitting .083 in 26 at-bats, but provided a boost with a two-run shot to center in the sixth. Santana earned playoff MVP honors after putting together a .308 average and 1.154 OPS in the postseason. The Quakes smacked 13 homers in seven postseason contests, six more than Visalia in 26 fewer at-bats. Friday night's outburst marked their 11th game with at least four dingers and the fourth in which all homers came from different players. On four occasions this year, they reached their peak with five roundtrippers in a single contest. "I don't really think it's about getting the ball in the air, it's about getting a pitch you can drive and then don't miss it," Saylor said. "That's been one of out mantras the whole year. ... I think the home runs are a byproduct of having productive at-bats." With the backing of the long balls, Rancho Cucamonga leaned on a former 40th-round pick and two rehabbing Major Leaguers to hold Visalia to two hits, both off the bat of D-backs No. 7 prospect Marcus Wilson. Isaac Anderson, a 25-year-old right-hander, yielded a single and a walk while striking out seven over six scoreless innings. Veteran reliever John Axford recorded two outs and surrendered a run on Wilson's double in the seventh. Tony Cingrani, sidelined since June 6 with a left shoulder strain, struck out two and walked one in a scoreless eighth. "[Anderson] had really good tempo, good pace, his fastball had finish on it. He was able to drop in his breaking ball for strikes," Saylor said. "The numbers speak for themselves. ... Just across the board, it was a really well-pitched night." Wilson finished with a .333 average and a .929 OPS in the playoffs. The 22-year-old center fielder spent the entire season with Visalia and batted .235/.309/.369 with 10 homers, 26 doubles, 48 RBIs and 60 runs scored in 111 games. 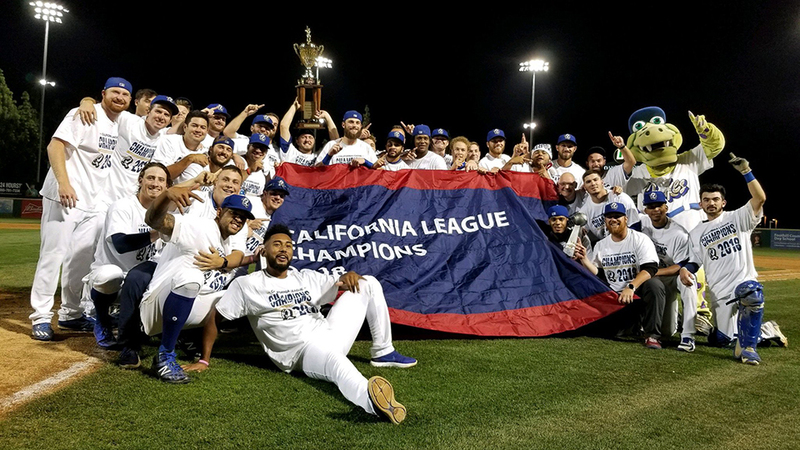 Rancho Cucamonga is the third Dodgers' affiliate to win a league championship, tops in the Minors. The Quakes clinched the crown at home for the first time since 1994, setting franchise records for wins in a season (87) and consecutive victories (15) along the way.